I’ve long been a fan of vintage television shows, many of which aired before I was born or I was too young to remember. I discovered them later during syndication and it was like finding something wonderful and sparkly beneath a Christmas tree. I’m a David Hedison fan. Yeah, I liked all that corny sci-fi on Voyage to the Bottom of the Sea—lobstermen, mermaids, and mutant aliens who wanted to get their sloppy tentacles on Seaview’s nuclear reactor. Imagine my surprise when I learned that David Hedison (Captain Crane of the Seaview) had previously starred in an espionage series known as Five Fingers. I heard of the show through friend and fellow author, Diane Kachmar. Diane regularly attends cons throughout the country with David, acting as his assistant, and helping him with the sale of memorabilia from his long career. She also maintains the David Hedison website, so it’s only natural she would be the ideal person to pen a book on the history of Five Fingers. Leiter, in Live and Let Die (1973) and License to Kill (1989), as well as Captain Crane on the television series, Voyage to the Bottom of the Sea, (1964-1968). Long before those roles, Hedison appeared as a CIA agent of a different sort in the1959-1960 20th Century Fox Television series, Five Fingers. His role was Victor Sebastian,a double agent within the then active Communist Party. Through his adventures every week,he was able to thwart their many nefarious plots, all while romancing his lover and muse, chanteuse Simon Genet, in addition to keeping his cover intact as a bon vivant talent agent at Wembley and Sebastian of London,Paris, and New York. Quite a balancing act, yet Victor Sebastian was always able to pull it off. 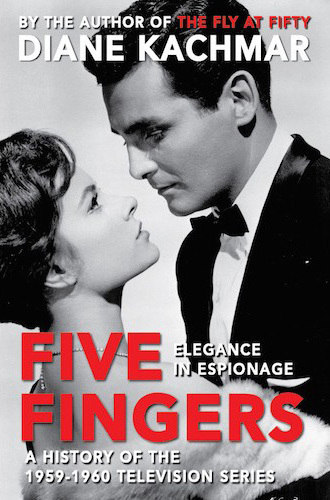 Five Fingers was one of three shows in 1959 that led 20th Century Fox Studios’ entry into series television. Some viewers believe that had Five Fingers not been programmed on Saturday nights against the Western, Gunsmoke (1955-1975), which was the #1 show on television in 1959, Five Fingers might have enjoyed that same success. The sixteen episodes chronicled here were syndicated around the world through 1965 and in the United States until the late 1970s. Five Fingers was a truly class act of a series. Discover why the series has lasted in popularity for over fifty-five years in the hearts of the show’s fans. Get Limited First Edition now. Available in hardback, paperback, and e-book editions. Grab your copy now, before some underworld spy beats you to it! This entry was posted in Book Release, Book Spotlight and tagged Classic TV, David Hedison, Diane Kachmar, Five Fingers, Mae Clair, Spy TV, Vintage TV, Voyage to the Bottom of the Sea by Mae Clair. Bookmark the permalink. Hmm, never heard of this one. Have, however, heard of Voyage to the Bottom of the Sea. It’s on late nights on the weekends, and it’s one of the old shows my hubby watches (along with Sea Hunt and Outer Limits). There’s a new “network” on the over-the-air (read: antenna) TV that shows all those older series, like Mission Impossible and The Saint. Some of those older shows are fun to watch, even without the rampant car chases and gun fights we see so much now. I agree with you about the older shows, Julie. There were some gems in the mix. I’ve caught episodes of the Outer Limits and a quasi/sorta/kinda remember Mission Impossible (showing my age). As for Voyage, I loved the show so much I bought the entire series on DVD, LOL! I remember Voyage to the Bottom of the Sea with fondness. I loved the series. I don’t know the Five Fingers series. I’m not sure it was shown in the UK and if it wasn’t that seems a pity. From what I’ve seen of it, Five Fingers was a class act, but it was released in a time when westerns ruled TV. It’s a shame it never caught on. Hi, Daisy Five Fingers was released in the UK as 48 minute movies – they played in theatres during 1961. If you look up Monthly Film Bulletin (for 19610 they had movie review. Great blog, post, Mae! Loved Myth and Magic! You are just a font of info on all things related to David Hedison, LOL. I loved sharing the post. Amazon tells me my book will arrive on Sunday (it’s great how they do Sunday deliveries now). I’m sure I’ll be delighted with it. I want more Caleb, too! I know. That sequel is loooong overdue! I am not familiar with it, but I can mention some vintage shows we could watch here: The Saint and Dallas. Up to a point. And then only movies from Romania or countries of the same system – socialist! Saint episode Luella Season 3 B&W. Sorry Carmen – Five Fingers never made it to Romania – that I know of. France and Finland in 1965 is as close as it got. Thanks for asking. I knew you would know, LOL! Australia got it. As did South America. Then Univision picked up the Spanish version of it – Cinco Dedos and ran that on WJNU in 1967 in New York, Long Island and New Jersey. 🙂 FIve fingers got around. I was a Gunsmoke fan way back when. Sounds like a fun book. Good luck with it, Diane! Thanks for dropping by to check it out, Sue! I didn’t discover Voyage until it was in syndication, but no arguing about David being a heartthrob, LOL! Still is! We get a steady stream of 60 something ladies who come to the table and tell us, “I had such a crush on you in 1965!” 🙂 David will be signing this book at Stan Lee’s Comikaze in LA Halloween weekend. Come check us out, if possible! Enjoy yourself. Hope it’s a great turnout! I love old shows, but I haven’t heard of Five Fingers. Interesting. What a fun post! Although I don’t remember Five Fingers from such a young age, it certainly sounds like the kind of intrigue I would go for. David Hedison I remember well– quite a fine actor and handsome to boot. Thanks, Flossie. David would make a wonderful historical romance protagonist. He is sweet, charming, and has this wonderful old school way about him, i.e. he stands up for you, waits until you sit down, gets the door. Lovely man, and as you said, so easy on the eyes. 🙂 I’ve enjoyed having him as the subject in three of my books as I collaborated on the 50th anniversary Voyage book as well – in 2012. Ahhh, I am such a sucker for that old world gentlemanly charm! I agree, Flossie. David was/is a class act. He will always be Captain Crane to me, but he made a dashing lead for an espionage show in Five Fingers. I do wish they would bring Five Fingers back to television again. I so enjoyed it 1959 through 60’s or could we purchase DVD’s on each show. Hi, Eileen. Many thanks for visiting my blog. I didn’t discover Five Fingers until just a few years ago thanks to a friend, but it looked like a fabulous TV series. I would love to see it released on DVD. I would definitely be in line to buy it as soon as it became available! Sadly, Fox let the 16mm masters warp and they are unusable. The “archive” has four episodes on VHS so a DVD release seems unlikely. You can buy an 11 episode (of 16 made) set on ebay, they are not the best quality, but all that is out there right now.